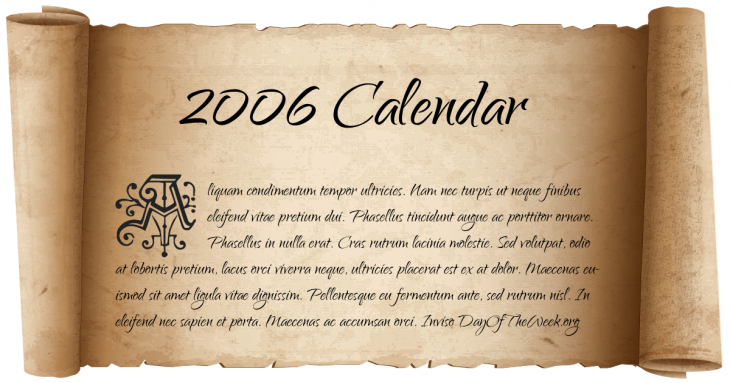 January 29, 2006 – New Year’s Day in Chinese calendar. Start of the year of the Fire Dog in Chinese astrology. March 20, 2006 – Cyclone Larry makes landfall in eastern Australia, destroying most of the country’s banana crop. April 2, 2006 – Over 60 tornadoes break out in the United States; hardest hit is in Tennessee with 29 people killed. May 5, 2006 – The government of Sudan signs an accord with the Sudan Liberation Army. May 21, 2006 – The Republic of Montenegro holds a referendum proposing independence from the State Union of Serbia and Montenegro. The Montenegrin people choose independence with a majority of 55%. May 27, 2006 – The May 2006 Java earthquake strikes at 5:53:58 am local time (22:53:58 UTC May 26) devastating Bantul and the city of Yogyakarta killing over 6,600 people. June 29, 2006 – Hamdan v. Rumsfeld: The U.S. Supreme Court rules that President George W. Bush’s plan to try Guantanamo Bay detainees in military tribunals violates U.S. and international law. July 3, 2006 – Valencia metro accident leaves 43 dead in Valencia, Spain. October 10, 2006 – The Greek city of Volos floods in one of the prefecture’s worst recorded floods. December 4, 2006 – Six black youths assault a white teenager in Jena, Louisiana, US; the subsequent court case becomes a cause célèbre. Who Were Born On 2006?